So what can we do to change the very culture of horsemanship and make it more ‘conscious’? What doesn’t work is ‘telling people what not to do’. And using punishment. Even God couldn’t make us obey ten simple commandments – no matter how wrathful the punishment. You can tell people not to smoke, not to overeat, not to get take drugs, etc, but it makes little difference. It can even make matters worse because we bring escalating conflicts into our relationships. If we add in punishment we are really on the helter-skelter to hell. So telling folks not to use a bit, not to use spurs, not to use excessive restraints is just as futile. And it also misses the point. Ghandi said ‘be the change you want to see’. To me, just as challenging and inscrutable, this means ‘take 100% responsibility for the relationship’. The big problem I find with relationships is that it seems like the other person (or horse) is ‘making us feel something’. We see ‘them’ as the source of our anger and frustration as well as our joy and happiness. So when we have a feeling we don’t want, we try to change it by changing their behaviour. It doesn’t work. It cannot work. Because our feelings are always caused by our own choices. Even if someone is attacking us psychically, on some level it’s because we’re allowing it to happen – we’re not protecting ourselves. A horrendous number of people believe horses are stupid because they don’t understand what we’re telling them! They understand only too well. Horses are a perfect mirror for our intention. That’s why they’re such a brilliant partner in relationship and leadership development. They give us ruthlessly honest feedback on our intention. Simply, if our intention is clear, they follow us. If it is not, they resist. A clear intention is one which, by definition, brings us the result we really want. Paradoxically, although, as a rider, we may think we really want a horse to execute a movement or jump a fence, on a deeper level we probably really want to enjoy ourselves and feel a sense of inner satisfaction. If we focus our intention just on our self-centred expectations of the task we automatically sacrifice the relationship that will enable this deeper result to happen. It gets worse: task focus from a ‘predator’ is what the horse instinctively has to avoid for its very survival. From this place of conflicting needs, the ‘normal’ human thing is to increase the pressure. If someone doesn’t understand us, we shout! We try to frighten them into submission to our will. Look at the News – it’s happening all the time. We are living in a backwards world where the solution to our problems is to terrify, torture and kill as many people as possible! What we abhor in how horses are treated is unfortunately just a reflection of some kind of global insanity. Yet, every time, we forget to align ourselves with a clear intent, we are defaulting to contributing to the same problem – albeit on a tiny scale. Do I say this to make you feel guilty? Of course not. Guilt is worthless – unless it motivates us to change our internal expectations. There are, however, some simple, basic principles we can apply and, with practice, use to change our own defaults and facilitate change in those around us. Every time we make a new positive choice we are changing the sum total of positive choices in the entire world. It is contagious. So a little does go a long way. I think we also have to be practical around horses. Sometimes, to get ourselves and / or them out of life-threatening danger we cannot (and should not) avoid drastic measures. None of us is perfect – yet. Decide to be 100% responsible for leading the relationship. Ask for what you want (as opposed to demanding it) – this means we must also be ok with a refusal – or we’re only pretending to ask. As a primary focus, work towards increasing trust, respect and understanding in the relationship. Use as little pressure as possible. 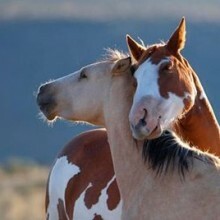 Assume horses are telepathic and give them the chance to tune into our frequency. AND use only as much pressure as is necessary (given that this can never include violence or abuse on any level: physical, mental, emotional). In order for a horse (or anyone) to respect us, it’s vital neither to be ‘nicey-nicey’ nor ‘nasty-nasty’. Forgive yourself instantly for making all too human mistakes. Or risk ingraining negative patterns. When we grow and heal the relationship with ourselves, then our outer relationships with horses and others will come into alignment and reflect this back to us.